In the summer of 2006, Boulder was the location for the Columbia Pictures&apos; romantic comedy-drama, Catch & Release, starring Jennifer Garner. This tour takes you through Boulder to the various scenes and locations. Start your tour in the heart and soul of Boulder. 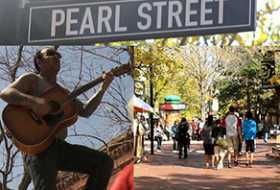 Just one block from the Hotel Boulderado, the Pearl Street was the location of a few scenes in the movie In an early scene, folk singers are performing here. Seeing musicians is a typical sight because Pearl Street Mall is home to many street performers year-round. Located in historic downtown Boulder on Pearl Street between 11th and 15th Streets. Jennifer Garner&apos;s character, Gray, works at a downtown newspaper office based on Boulder&apos;s local newspaper, the Daily Camera. The historic home of the Camera is now an exciting new development called Pearl West, between 9th and 10th on Pearl Street. Grady&apos;s Mom, Mrs. Douglas, ruthlessly asks Gray to return the family&apos;s engagement ring. You&apos;ll recognize the Boulder Creek Bike Path from this scene in the movie, but the actual location was fabricated and filmed in British Columbia. The path follows Boulder Creek and stretches for more than five miles right through downtown Boulder. It can be easily accessed just two blocks from Pearl Street at 9th and Canyon, 11th and Canyon, and at Central Park at 13th and Arapahoe. Or rent a bike to ride along the path. This is the cabin where Maureen (Juliette Lewis) stayed while visiting Fritz. It&apos;s located on Boulder Creek, at the mouth of Boulder Canyon, about five minutes from downtown Boulder at 90 W. Arapahoe Avenue. The Boulder Creek Path runs right past the Silver Saddle. Mrs. Douglas sees Grady&apos;s son for the first time at the Boulder Farmers&apos; Market. 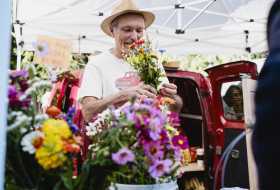 The market is open Wednesdays 4pm–8pm, May–October, and Saturdays 8 am–2pm, April through November. Grab a plate of food made by a local chef and sit on the grass at the park. It&apos;s a great way to feel like a local! It&apos;s located on 13th Street in between Canyon and Arapahoe next to Boulder Creek and Central Park. This is where Fritz (Timothy Olyphant) makes the initial phone call to Maureen telling her the tragic news about Grady. The red awnings of The Sink restaurant make an interesting backdrop. It&apos;s located near downtown in an area called The Hill, which is near the University of Colorado and where you&apos;ll see lots of students. Coincidentally, Robert Redford was a busboy at The Sink years ago when he attended the university. The Sink is at 1165 13th Street. The house that they live in is located on Grant Street between Baseline Road and College Avenue. It&apos;s a quiet residential street with typical architecture for the neighborhood. The exterior scenes were filmed here. Remember all the funny t-shirts worn by Sam? In the movie, Sam works at Celestial Seasonings, where his job is to select the poems to go on the artful tea boxes. He wears his "work" shirts in the movie and sometimes refers to the quotes which added a light comedic element to the movie. Celestial Seasonings is located about 10 minutes north of downtown Boulder at 4600 Sleepytime Drive. It has an excellent free factory tour every day, a gallery full of the art that&apos;s appeared on boxes, a tasting room and a gift shop. Maureen is a massage therapist who makes an emergency visit to Boulder to visit Fritz and meet Gray. There are many massage therapists in Boulder including the Boulder College of Massage Therapy, now located at Naropa University. Fly fishing is the metaphor for love — and life — in the movie. Front Range Anglers and Rocky Mountain Anglers, local outfitters, can teach you how to fly fish or help enhance your skills at their secret spots. The movie takes place in Boulder because the sister of Susannah Grant, the writer/director, lives in Boulder. Susannah is also the Academy Award-nominated screenwriter of the movie Erin Brockovich.